There are three things that are inevitable for the fly fisherman. Death. Taxes. And accumulating too many flies. It's just a simple fact of life that any angler will, in time, accumulate all sorts of flies that threaten to eventually fill the house. An Orvis Foam Fly Box. Simple, but affordable and effective. See more Orvis Fly Boxes at Amazon. And thus arises the problem of what to do with them all. Flies are light and don't take up much space. But that’s a problem unto itself, since stuffing flies into a box with other dissimilar flies creates an organizational problem nightmares are made of. For this reason, anglers, whether new or experienced, always need to keep one step ahead of the organizational nightmare their flies threaten. This is accomplished through the judicious use of fly boxes, fly wallets and "on the road" fly storage systems. Each have their place, and which one is right for a particular angler depends on the anglers own personality, number of flies owned and other personal considerations. In short, there is no "one way to store flies." Just be sure to find a way to store flies that works well for you before the flies consume your life. When organizing flies, the angler needs to think about both how to organize the flies for off-stream as well as on-stream use. Unless you have less than 100 or so flies, there is absolutely no reason to bring every fly you own to the river. Instead, the general plan of attack is to have a main fly storage system/boxes/whatever that holds all your flies when home and is yet portable enough to take with you in the car or on the airplane. Then, when you reach the water, you take whatever flies you need out of this fly storage system and put them in the fly boxes you'll actually carry while fishing. There are two big benefits to this system. First, by being choosy about what flies to take, you avoid overloading the fishing vest with innumerable fly boxes. This keeps the fishing vest relatively lightweight and not nearly as bulky. And while a heavy fly fishing vest isn’t a big deal for a short day of fishing, during an all-day fishing trip a heavy fishing vest has a tendency to feel a bit like King Kong by the end of the day. The second benefit to this system is that on-stream organization is improved. This is no small benefit. By knowing exactly what flies you have on the water, and where they are stored in your vest, you’ll spend less time “searching for flies” and more time “using the flies.” Since it is a bit difficult to catch fish while “searching for flies,” this system helps insures more productive fishing time. A very large fly box. Use as a master fly box. Don't take it to the water. More Fly Boxes at Amazon. So, this leads to the question, what to use for at-home/in-the-car fly organization. Well, there are several ways to go about it. If you don’t own a large number of flies, probably the easiest method is to store your flies in a multitude of different fly boxes. The catch is that you need to be sure to grab them all when you travel. More than a few anglers have hit the Bighorn River only to find their nymphs back in New York. For those who own many flies, or those who simply want a simple way to travel with them, the other good option is to use a specially designed piece of fly fishing luggage to carry all the flies. Basically, how it works is that you first get some larger, inexpensive fly boxes. These fly boxes are then neatly stored in the luggage, along with other fly fishing gear. The benefit to this is obvious. An angler can carry many, many flies while keeping them all easily grouped with other gear, thereby avoiding lost fly boxes and making it much simpler to find the flies that you actually want to use. For on the water-storage of flies, there are several routes to choose from. The one I prefer is one medium box and two smaller ones. The medium box consists of foam on both the bottom and top. The two smaller boxes are both foam boxes, too. The medium box goes in the right pocket and the two smaller boxes go in the left pocket. This system has the benefit of being inexpensive, keeps organization a breeze and allows you to take enough flies so as to not have to worry about trudging back to the car to get more. It also has the advantage of allowing you to "load up" on your favorite fly for the day. Other systems exist, of course, for on-the-water fly organization. Some anglers prefer to get one large box that holds all the flies they need for on-the-water use. This keeps all the flies you need in one place and also frees up one of the larger side pockets on your vest for other uses. Yet other anglers do what I call the "fly box by name" system. The angler gets a bunch of small compartment or foam boxes that are very small in size. Each box will hold only one type of fly, in differing sizes. While this seems like it may be limiting, in fact, the system does have its advantages. If you know that the trout are hitting on the Parachute Adams, there isn't much of a reason to go out with a bunch of hoppers or streamers. Instead, you're better off going armed with differing sizes of Parachute Adams and flies that look very similar to it. And those tiny little "fly by name" boxes are a fine way to keep particular flies organized by size, while still making sure you have enough flies of the right type in the right size for the type of fishing expected. Anglers that use this system invariably label each fly box with a waterproof marker so as to specify what each fly box holds and to avoid accidental insertion of the wrong fly. Of course, the downside to this is that you can potentially end up with lots of small fly boxes in your vest, leading to organizational problems. But there are ways to partially counter this, especially once the system has been used for a while. While this system isn't for me, it just might be for you. As a person who probably owns too many fly boxes, one thing I’ve learned is that I do not like fly boxes that lack clear lids. I like being able to look inside the fly box without having to open it up. While I have a “color-coded” fly box system for on the water use, during the excitement of a hatch it is all too easy to forget “which color goes with which type of fly.” Being able to simply glance at a fly box and see what is inside reduces frustration and saves precious minutes during a good hatch. If you are unable to find a fly box you like that has a clear lid, then make sure to write down (using a waterproof marker) what the fly box contains on the outside of the lid. Fly boxes are, like many gear items in fly fishing, a bit of a personal item. We all have our preferences and dislikes. Since I don’t like bulky things, I prefer “slim” fly boxes and avoid fat ones. 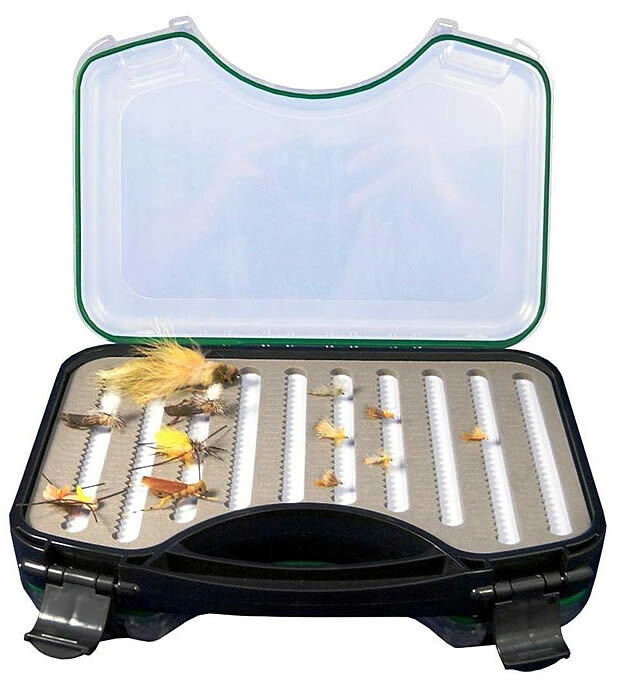 A happy side benefit of using slimmer fly boxes is that it limits the amount of flies that are taken to the water, thus reducing organizational problems. I also prefer foam boxes to compartments. The reason? With foam fly boxes I find it far quicker and simpler to put the flies in the box and to take them out. While a compartmentalized fly box “seems nice,” in actual practice I’ve come to have a healthy dislike for them. When using fly boxes that contain enclosed compartments for flies, I have found myself spending far too much time opening and closing tiny compartments in a frustrating search for a specific fly. With a foam box, I can always see all the flies the box contains at a glance and avoid having to meticulously open and close numerous compartments. Another reason I’ve come to dislike compartmentalized fly boxes is that they hinder drying out of the flies once the day is done. A fly that is in an enclosed compartment inside a fly box will take forever and a day to dry out. Worse, it is all too easy to “forget” to open up all those little enclosed compartments to allow the flies to fully dry. As for quality considerations, most fly boxes do the job. The only real “quality criteria” I have is that a closed fly box needs to “stay closed” unless I specifically open it. I’ve found that real cheap fly boxes do have an unpleasant tendency to open if handled incorrectly, suddenly springing open when least expected. Since a fly box that opens unexpectedly is a fine way to send dozens of flies off on a float trip down the river, it is worth spending a bit more money for a fly box that doesn’t have this issue. Thankfully, these dirt-cheap fly boxes aren’t sold at quality fly fishing shops or online at quality stores like Orvis and Cabela’s. Perhaps another question is...where can't you buy a fly box. 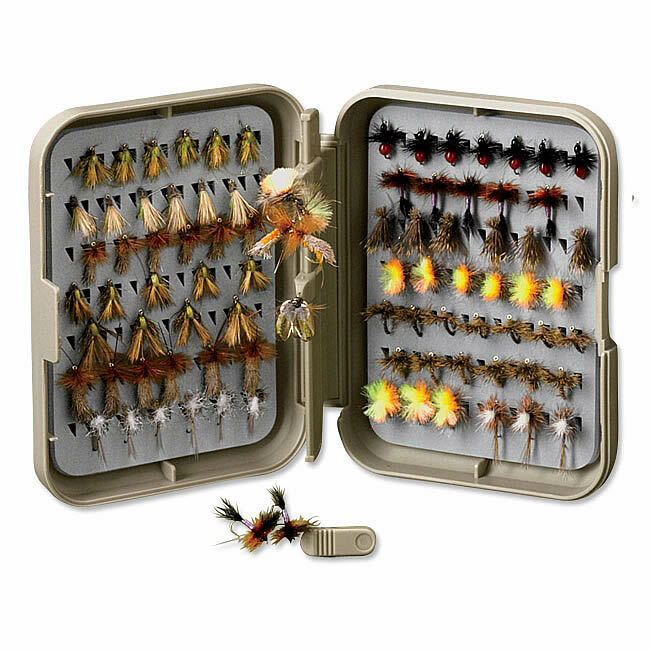 Offline, any fishing shop should carry a multitude of fly boxes in various shapes and sizes. Just be careful to get decent and lightweight boxes.